We all know that ingesting fresh fruit is beneficial to our health, but we may not know what kind of benefits we get when we consume various fruits. 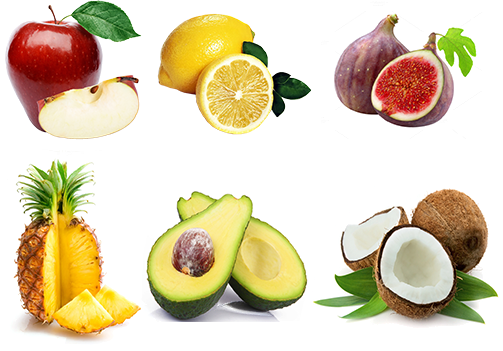 Some fruits come in handy during times of sickness, others can be used to clear up acne, while most fruits are beneficial all around. Read on to find out the benefits of your favorite fruit and which ones to stock up on next time you are at the farmer’s market. Pineapple – Pineapples are full of antioxidants that prevent free radicals in the body, heart disease and several types of cancers. They are also chock full of vitamin C, which aid in colds and digestion. This fruit is also known to relieve nausea and reduce inflammation in bronchial tubes. Pineapples are also a natural cure for chapped lips, acne and other inflammatory skin conditions, and hair loss. Check out several more benefits of pineapples here. Lemon – Lemons are well known for their antibacterial properties, which can help with bronchial and throat infections as well as other deadly diseases. It’s high vitamin C content help fight infections like the common cold and the flu, and also helps neutralize free radicals. Check out more information on lemons. Apple – An apple a day does keep the doctor away. In fact, adults who consume at least an apple a day are 27% less likely to develop a chronic disease like diabetes or cardiovascular disease. Simply chewing an apple helps clean your teeth for a healthier smile. High levels of antioxidants prevent against Parkinson’s disease and boost your immune system. Apples also prevent simpler health ailments such as gallstones, diarrhea, constipation, and detox your liver. For more benefits of apples, check this out. Coconut – Coconut is a mega-super fruit. Valuable and necessary in all forms, coconuts are anti-viral, anti-bacterial, anti-fungal, and anti-parasite. Natural enzymes in coconut water aid in digestion and metabolism. Coconut water is also suggested to be healthier than whole milk and can aid in the cure of hangovers. Coconut oil can be used for dry and/or oily skin, can promote shiny and healthy hair, and as a makeup remover. For more benefits of this power-fruit, check this out. Cantaloupe – Special antioxidants in this type of melon prevent macular degeneration in the eyes. High amounts of beta-carotene make this fruit powerful in lowering the risk of asthma and preventing multiple cancers including colon and prostate. Also, high vitamin C quantities protect heart health. This type of melon also prevents inflammation, dehydration and aids in keeping bodily tissues, including skin and hair, moisturized and healthy. Loving this kind of melon? Check out more information on cantaloupes here! Avocado – Of course America’s favorite fruit is on my list. High levels of vitamins E and C make this a top notch anti-inflammatory fruit, as well as B vitamins to help fight off diseases and infections. Avocados also maintain blood sugar and blood pressure levels as well as reduce the risk of cataracts and macular degeneration. This fruit is ideal for a healthy heart, weight, hair and skin. For more benefits of the avocado, check this out. Fig – High amounts of calcium and potassium promote bone density. The omegas found in this fruit aid to maintain blood pressure and prevent heart attacks. The risk of breast and colon cancer can be lowered with daily consumption of figs. The high water content makes this fruit a perfect skin cleanser, and can aid in skin inflammation when applied directly to the skin. Full of Benzaldehid, figs can kill fungus and viruses in the body. Feeling figgy? Get more facts here. Reblogged this on Katelyn Hawkes.